Home Reviews Todoist vs Wunderlist: Which To-do List App You Should Use? 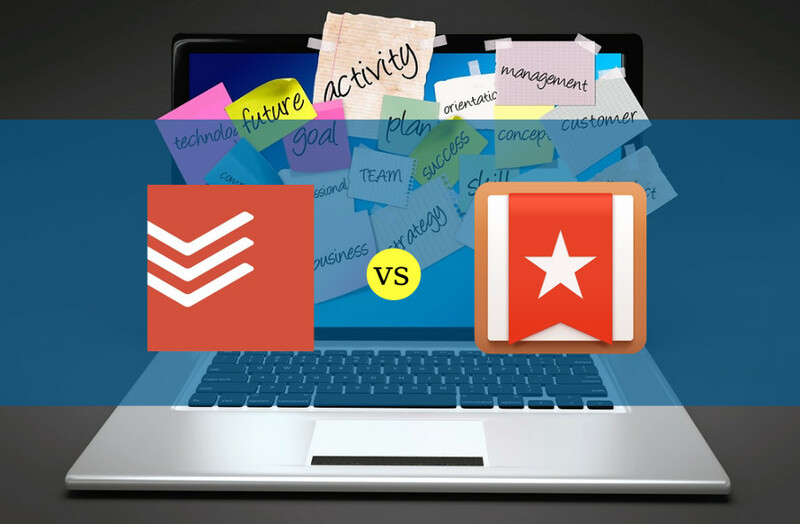 Todoist vs Wunderlist: Which To-do List App You Should Use? The market of productivity app has been crowded enough, but when you get in to a more specific area — to-do list app — there are at least two standout names: Todoist and Wunderlist. They both have the same purpose to help you to organize your tasks. Which is the better between them? Be it Todoist or Wunderlist can be used to organize your personal tasks. They both also allow you to share certain tasks to a or more persons for a collaborative work. The tasks you can organize with these tools don’t have to job-related tasks. You can, for instance, create a list of upcoming movies you want to watch. Both Todoist and Wunderlist tend to have the similar features, but once you dig deeper you will find that there are some details that make them different. Let’s find out what makes them different. As mentioned, both Wunderlist and Todoist have the similar features, but there are some details that make them different. When adding a new task in Wunderlist you can easily add a note as well as file attachment. These features are useful especially if you intend the task to be assigned to your team members. You can add a short description what should they do with the task you assigned, while the file attachment can be used to add the supporting materials. Those features are basically also available in Todoist, but you need to upgrade to premium. One of the useul features offered by Todoist and not available in Wunderlist is task priority. The feature is useful to filter the existing tasks based on the priority levels so you can easily determine which tasks should to get done first and which ones can be done later. In Wunderlist, you can take advantage of the tagging feature if you really think that you need to filter your tasks. In order to get your tasks be more organized, both Wunderlist and Todoist also have a feature to organize them. 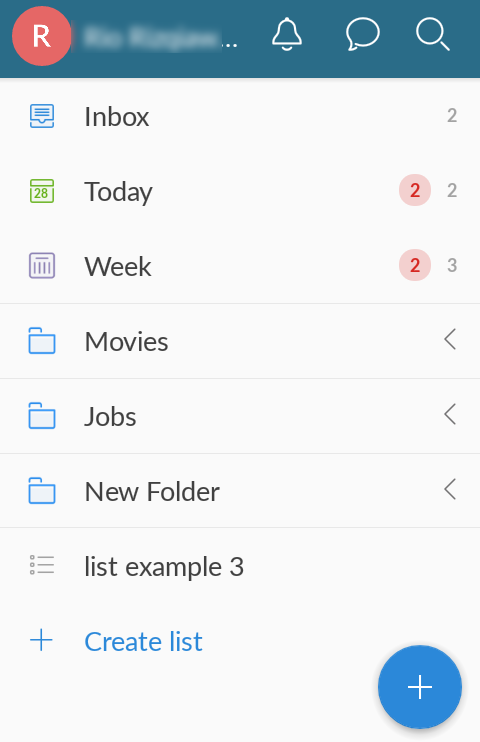 In Todoist, the feature is called project, while in Wunderlist the feature is called list. In Todoist, you can use different colors on each project, something that is not available in Wunderlist. However, Wunderlist has an additional feature to make your tasks — or more precisely lists — be even more organized. The feature is folder. You can use this feature to put together certain lists. This feature is particularly useful if you have to work with smaller devices like smartphone. The rest, hardly any different between the features offered by Todoist and Wunderlist. They both allows you to add due date as well as reminder to each task. You can also add sub-tasks on the existing tasks. To-do list apps like Todoist and Wunderlist won’t helpful enough unless you are able to add new tasks from across-device. Fortunately, they both offer official apps for a wide range of platforms. Both Todoist and Wunderlist are available on Web, Windows, Mac, iPhone and Android. Both Todoist and Wunderlist don’t offer a Linux version. Todoist is one step ahead in this part since it also offers official apps for wearable gadgets. Todoist is available on Apple Watch as well as Wear OS-based gadgets. As mentioned, you can also use both tools as a collaboration tool, other than personal task management. To do so, you can share certain tasks with your team members. In Wunderlist, you need to invite the team members you want to share the tasks with before being able to assign certain tasks, while in Todoist you can easily assign certain tasks without having to share the project in which the tasks belong to. 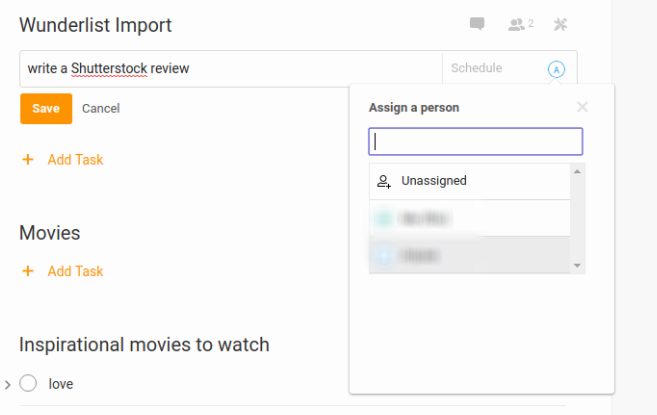 Keep in mind that when you have shared certain lists/projects, anyone will be able to assign tasks. There is no manager-subordinates rule here. They will also be able add as well edit tasks on the list/project you have shared. Unless you upgrade your account to premium, you won’t get good enough experience in using Todoist for a collaboration tool since most collaboration features, like comment and file attachment, are only available for premium version. In Wunderlist, both features are available for all versions, including free version. Both Wunderlist and Todoist offer a bunch of integrations to allow you getting the most out of another productivity apps you are using. Each integration works different way based on the service you use. For instance, the Todoist integration with Gmail allows you instantly turn a Gmail message into a new task, while Wunderlist integration with Google Chrome brings your Wunderlist tasks lists to a new Chrome tab. By default, Todoist offers more ready-to-use integrations than Wunderlist. There are tens of integrations offered by Todoist, while Wunderlist (at the time of writing) offers only 13 integrations. The free version of both tools are already give you great enough experiences to organize your tasks. If you want to unlock more features, you can always upgrade to the premium version anytime want. How about the pricing? First, you need to know that be it Wunderlist or Todoist offer two paid packages: Premium and Business. If you want to use them as a collaboration tool then you can consider the Business package, although the differences are basically not too significant. The paid packages of Todoist are a bit cheaper than Wunderlist. For instance, the Premium package of Todoist costs $2.5 per month, while the Pro package of Wunderlist costs $4.99 per month. Both accept payment via credit card and PayPal. One thing. Todoist doesn’t offer monthly subscription. Although the price tag says $2.5 per month, you will be billed annually with the amount of $28.99. On the other hand, Wunderlist offers monthly subscription which gives you flexibility if one day you want to make a switch. Both Wunderlist and Todoist have a beautiful interface you can customize. Wunderlist has a more beautiful interface than Todoist, with a beautiful background image. Todoist offers only solid colors with orange becomes the default color. Another good feature of Wunderlist is that it offers right-click functionalities for easier operation. A pop-up menu will appear every time you right-click on a list or task. However, there are also some additional features that offered by Todoist that are not available in Wunderlist. For instance, Todoist offers Karma feature to encourage you to be more productive. It is a small report showing your productivity this week based on your color-coded projects. The more tasks you get done within a week, the higher Karma score you will get. In addition, Todoist also features a log activity feature which is so much useful if you use Todoist as a collaboration tool since the feature allows you to monitor the progress of the tasks you have assigned to. Both Todoist and Wunderlist are standout enough names in the to-do list app market area. In general, the features offered by those two tools are not much different. However, as described above, there are some details that make them different. For instance, Todoist offers a Karma feature to encourage you to get done more tasks each day, while Wunderlist has no similar features. Conversely, Wunderlist offers more features to allow you organize the tasks and lists. Be it Todoist or Wunderlist adopt premium businesses model. You can upgrade your account anytime you want to unlock the premium features. Wunderlist is a better suited option if you prefer a to-do list app that offer monthly-based subscription since Todost requires you be committed in a yearly contract. Todoist is also a better suited option if you have no plan to upgrade your free account since the free version of Wunderlist offers more features than Todoist. But overall, assuming that you are on the premium plan, Todoist is better at helping you be more productive thanks to Karma and log activity features. Have different idea? Share it in the comment column below.